With the weather turning warmer my house starts to turn into a sauna. We live in a great old brick house, the only problem is that it traps heat in the winter and loses heat in the winter. It's not horrible until I turn on the oven for hours at a time, then it is rather unpleasant. The high humidity doesn't help the situation either, so in the middle of summer I turn to my crockpot. I'm not a fall/winter crockpot user. I actually find that I use my slow-cooker the most in the hot summer months, it does wonders for keeping my kitchen cool when the heat rises. Since I make crockpot recipes so frequently throughout the year, I am always looking for new interesting recipes and I was happy when the march issue of Family Circle magazine had a recipe for Slow Cooker Lamb and Cilantro Curry. This recipe has 13 ingredients. It takes 25 minutes of prep and 8 hours on low in the crockpot and makes 6 servings. Due to my forgetfulness (thanks to my kids :) I actually ending up buying pork, instead of lamb. I definitely think I need more sleep...So needless to say I made a major modification to this recipe and used pork shoulder. I always braise my meat before placing it into the slow-cooker. This recipe doesn't have that step, but I highly recommend it. Braising helps to seals in the flavor and moisture in meat and makes all the difference for keeping meat moist. Instead of pulling off the leaves of the cilantro (which is time consuming) I chopped the tops off and placed them in the blender. Finally I used a fresh lemon for the 3 tablespoons of lemon juice. One large lemon makes about 3 tablespoons of juice. I followed the remainder of the recipe as written. This recipe is very easy to prepare. Even with my large modification to the meat the end result turned out well. The pork worked well with the flavors of the curry. 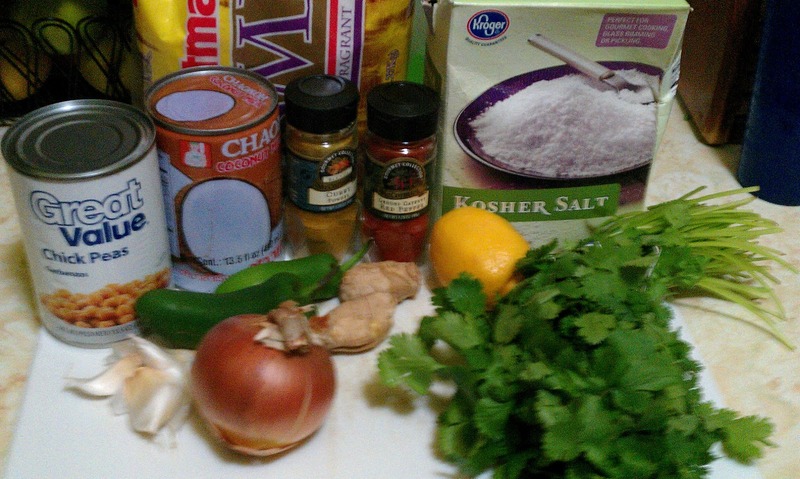 I would recommend adding more curry powder if you are a fan of a strong curry taste. This dish only has 1 teaspoon of curry powder, which leaves a mild curry flavor, for bolder flavor I would suggest adding up a tablespoon of your favorite curry powder. Overall, a very easy crockpot recipe that made enough for multiple meals. For the recipe go to Slow Cooker Lamb and Cilantro Curry. Thanks :) It turned out well even with the changes! I love curry and my crockpot also :) Jamaican curry sounds yummy! Have a great weekend! Thanks :) The flavors worked really well together! Ooooh, that looks delicious! I love curry and crockpots--this looks like a winner! Thanks for stopping by Preschool Powol Packets--I'm so glad you found me! I look forward to more recipes from you!! Thanks :) I agree crock-pots are the best! It's not even 8am, and I am salivating looking at this! This weekend is a busy one, so I'm excited to try this tomorrow for dinner - thanks for sharing! Come by and link up your recipe today for Foody Friday! Hello, and thanks for following me and commenting on my bloggy mom's post. I'm sooo following you back, particularly having landed on this lamb curry recipe-nobody loves curry like my family. I'm looking forward to getting you know you better. My family really loves curry also :) Come back again soon! Yeah my forgetfulness has gotten worse since having kids :) I love lamb and curry also, if I can remember to actually buy the beef! I hope you like the recipe if you try it! Thanks :) I hope you come back and find some recipes to try! BRAVO on the recipe & BRAVO on your site!!! When I saw the ingredients I knew off the bat it was going to be awesome!But whatever you do please keep it coming!! !I'll definitely spread the word, on the recipe & the site as well. When you get a chance link to www.crockpotking.com, I'm always posting one of a kind recipes. Thanks for adding my link to your site :) Your site looks great, I love anything to do with slowcookers! Come back again soon, I post a lot of crockpot recipes!